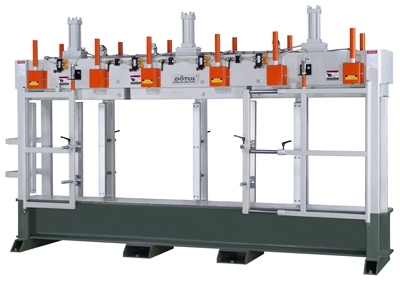 Fixed platen stile door ( windows) press This assembly door machine ( windows machine ), this press can also be used to apply veneers to a substrate or any type of core material desired. Air pressure required: 90 PSI (100 PSI MAX). Capacity: 40 pc 15/16" thick - 50 pc 3/4" thick 3-1/4" Width to 11-3/4" wide, 48" to 100" long. Or 50 pieces 3/4" for 1-1/2" thick door stiles blanks, 3" wide to 11-3/4" wide, from 48" long to 97" long. Thirty thousand (30,000) pounds air pressure is applied to the platen by two 3-1/2" diameter air bladders at a regulator setting of 100 PSI.